They restricted Dig, and off to work we went. We brewed and we tested and we tuned and we tested and we brewed and we tuned. 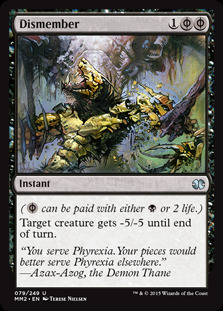 Dig Through Time was a great card, and I think it obscured a lot about the format. We can take a fresh view of things now that Dig took a bite of proverbial poison apple. By now, it should clear that we’ve been in a new era of Vintage for quite some time, much much longer than two months. 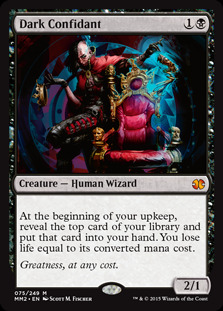 Jace, the Mind Sculptor, unalterably transformed Vintage because he made it important to have creatures on the table. Playing against Jace without a respectable cohort of creatures in your deck just doesn’t work out well. Jace isn’t as good as Moat at being Moat, nor as good as Serra Angel at being Serra Angel, but he can still do some of the things those cards once did. Meanwhile Jace is so much better than Jayemdae Tome at being Jayemdae Tome that it’s embarrassing for Jayemdae Tome. Jace, the Mind Sculptor, is every non-mana permament The Deck ever played all rolled into one aggressively costed planeswalker. Since his printing, Jace has been such a powerful force on the side of the big orthodox control deck that, like Tarmogoyf before him, he has raised the bar for what creatures can be. Jace has many powerful contemporaries: Lodestone Golem, Stoneforge Mystic, Delver of Secrets, Snapcaster Mage, Griselbrand, Deathrite Shaman, Young Pyromancer, Thalia, Notion Thief, Monastery Mentor, Master of the Pearl Trident, and True-Name Nemesis. Hardly any creatures playable today even existed before Jace was printed. Jace exists, Wizards seems to be proposing, so how impressive is a Siege Rhino really? The combination of the Jace deck and all these amazing creatures has given rise to the creature-based blue control decks. Historically, the creature decks were Fish decks. Not always Merfolk proper, these Fish decks generally had between fourteen and twenty creatures, and mana denial featured prominently in their game plan. They played Wasteland, almost without exception, and often Null Rod or maindeck artifact removal. But since Jace’s printing, the likes of Bant, BUG, Delver, and Mentor ever more replaced the Fish decks of old. We see in the movement from Bant to BUG to Delver to Mentor, the super-type gradually playing more like a control deck and less like Fish. We can look at Delver alone and see a steady transition from an aggro-control deck closer to Fish in 2012 towards something approaching hybrid-control in 2015, with Mentor, Delver’s spiritual successor, being the ultimate break from the aggro-control archetype. Today, the fair creature decks in Vintage have just as much card draw and countermagic as the combo-control decks. If Jace and Lodestone are the most important cards for the contemporary era of Vintage, the metagame is fundamentally defined by the rise of Workshops on the one hand and the this continuous shift from Fish to aggro-control and hybrid-control on the other. The creature decks used to play Wasteland; nowadays they play Gush. As long as powerful planeswalkers exist— and their ranks have only grown since Worldwake— the fair blue creature decks will be around to fight them. We don’t have good name for this super-type. The sometimes-used term Gush Aggro unfortunately excludes BUG, which, notwithstanding severe differences from Delver and Mentor, we definitely want to be clear we are including. I would offer the term creature-control, but this errantly suggests that these decks use creatures like Meddling Mage, Eidolon of Rhetoric, Spirit of the Labyrinth, and Qasali Pridemage. We should look to Jace, the Mind Sculptor, for help. Ultimately, these decks are all anti-Jace decks, or, more broadly, anti-combo-control. Unsurprisingly, the anti-combo-control decks play best against combo-control decks while looking to their sideboards to make them competitive against Dredge, Oath, Workshops, etc. Unlike the Fish decks of old, the contemporary creature decks, the anti-combo-control decks, adequately defend the format against engines like Thirst for Knowledge and Gifts Ungiven. The Mind Sculptor forced Vintage to develop these archetypes in its metagame, and I would argue that creatures like Delver of Secrets and Deathrite Shaman are played ultimately as a countermeasure to Jace, Dack, and even Tezzeret. Ironic, then, that in their effort to defeat Jace, the creatures make Gifts Ungiven and Thirst for Knowledge close to unplayable, while Jace remains as good and as mission critical as ever. I’m beginning to think that most cards don’t really matter. What I mean is that most cards are just marginally different from one another. When Thirst for Knowledge was restricted, for example, the Tezzeret decks switched over to Dark Confidant and remained so dominant that the Wizards had to print Preordain two years after restricting Ponder and then unrestrict Gush a few months later. Thirst may have been better than Dark Confidant, and building Thirst decks and Bob decks might involve some significant differences, but really one card is just marginally better than the other. The tactics change, maybe even the intermediate strategic objectives change, but nothing really changes. The deck still wins with card draw, counterspells, and Tinker. Bob and Thirst do similar things for similar costs, and the metagame adjusts to mutes their differences. Thirst may have been marginally better, but that just meant the deck was marginally more dominant, marginally more popular, marginally more concerned with the mirror, and marginally more disruptible by a field marginally more prepared to face it. Most cards don’t matter as much as we think they do, they are just the best possible version of a given effect. But the cards that are unique are incredibly important, especially if unrestricted. We are talking about Force of Will, Mental Misstep, Gush, Chalice of the Void, Lodestone Golem, Bazaar of Baghdad. There aren’t marginal downgrades from these cards because there aren’t really downgrades at all. It is probably the case that a slightly worse Force of Will would not be playable in the format, even if the Force itself were senselessly restricted. But I’m entertaining hypothetical variations of hypotheticals here, and better I return to reality. 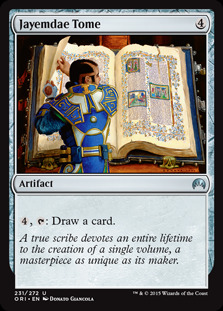 We, or at least most of us, should probably feel foolish to have considered there was a chance Thirst for Knowledge would dominate the format. We cautiously warned each other that we had forgotten how dominant Thirst was in 2008–2009, but we forgot to actually remember what Vintage looked like. We had a ton of historical evidence that supported Thirst being only marginally playable upon its return to the format two months ago. The only times Thirst has been very good have been when neither Gifts Ungiven nor Gush were unrestricted. Gifts is a more powerful expensive draw spell, while Gush is a vastly more efficient Divination. Thirst might be only marginally worse in the decks built around it, but marginally worse is enough to make a card unplayable, and we can look to Fact or Fiction and Night’s Whisper for evidence of that. It’s particularly interesting, given the preponderance of evidence we had for Gifts Ungiven’s unplayability, that we feared Thirst for Knowledge to reenter and dominate the format. More than a few Vintage players had apocalyptic visions of what the format would become losing Chalice and gaining Thirst. But we failed to ask the important questions. Is Thirst better than Dack Fayden? Is it better than Gifts? Is it better than Gush? Is it better than Preordain? We forgot to remember that when Thirst was restricted in 2009, many disagreed with the decision. The Tezzeret deck was dominant, though, and clearly something had to be done. By simple process of elimination, the DCI moved past Mana Drain and Tezzeret to settle finally on Thirst. The deck just replaced the card and remained as dominant as ever. Next man up. Solving the combo-control problem required a combination of unrestriction and new printings. Wizards couldn’t get a new card into a set quick enough to affect Vintage in 2009, but Preordain eventually arrived in July 2010. While the DCI could have unrestricted Ponder at any time, Preordain gave the format a similarly powered cantrip but one that was less powerful in combo decks, and so a bit safer. Combined with Gush’s unrestriction a few months later, Vintage now had the staples in place for the anti-combo-control archetype that would become one of its cornerstones. And I think it’s valuable to look at struggle between combo-control and anti-combo-control as one of two main narratives of Vintage’s past half-decade. The second was Workshops, which just kept rising in dominance and metagame share ever since Lodestone Golem was printed in Worldwake. Chalice’s restriction, should it remain restricted, marks the end of that story. The five years since Worldwake were defined by these twin narratives: the rise of blue creature decks and their fight against Jace and combo-control, and the quieter but unrelenting rise of Workshops. I think we can look at the format as having a central conflict between combo-control, anti-combo-control, and Workshops, with a flank consisting of Dredge, Landstill, Storm, Hatebears, City Vault, etc, each attacking that center. But without Chalice, a great deal of the energy that both combo-control and anti-combo-control devoted to fighting Workshops is redistributed. Fundamentally, Workshops, reduced both in metagame share and power, is forced to come at the format from the flank rather than control it from the center. Workshops today attacks the metagame, and we are seeing almost all the successful Workshops decks being designed from this perspective. Whether Andy Probrasco’s excavation of Adrian Becker’s Affinity deck from the 2013 NYSE, or Niels Thiim’s Dark Depths Shops, we see Workshops attacking the metagame rather than setting it. This is fundamentally different from even two months ago, and certainly different from six months ago when you could not play five matches in a row without losing to Kuldotha Forgemaster. We are left, then, with a center consisting just of the combo-control Mind Sculptor decks and the anti-combo-control Vryn’s Prodigy decks. That might sound terribly boring, and nothing is going to keep the people want to make Vintage happen from playing their Thoughtcasts, Expedition Maps, and Dark Rituals. But there’s also something pretty exciting about a format where this is a tier one deck. In what other format do you get to play a deck like this? A week ago, Rich Shay played a slight variation of this list and split a Mox Pearl in a 33 player tournament in Cambridge, Massachusetts. Meanwhile, Vintage Champion Brian Kelly piloted his original version to a second place finish in a 108 player field at Eternal Extravaganza 3 in Coopersburg, Pennsylvania, back in October. In Mentor, they have a Moat/Blightsteel Colossus that is dependable enough they can afford to turn their Sylvan Library into a two mana Ancestral Recall. 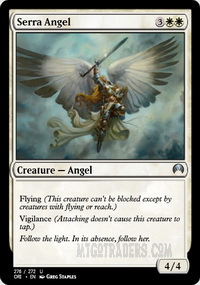 Then Dromoka is this absurd uncounterable Serra Angel, upgrading vigilance to lifelink. And Jace makes Jayemdae Tome look like a picture book. It’s The Deck, but it can also cast Monastery Mentor off some moxen on turn one and swing for lethal on turn two. In both Brian’s Championship deck and the above list, the most recent update of the Mentor Midrange shells he’s been sometimes playing since the Spring, we can observe a pretty deep understanding of how moxen make Vintage a fundamentally different format from any other. Moxen create inherent role flexibility by allowing us to expand our mana supply in ways that defy the normal physics of Magic. Monastery Mentor and Jace are ideal control finishers, but moxen mean we can also sometimes cast them in the games early stages, or cast them on schedule but also keep up mana for Flusterstorm or Pyroblast. Moxen give us temporal flexibility as it relates to our land drops, and this completely changes the usual rules about what aggro and control decks have to look like. Contemporary Vintage finds itself in this place where, while the broken decks are certainly still out there, just as many if not more players are simply using broken means, like moxen, for fairer ends. I think this the format likely resembles this for a good long while. The power creep of modern creatures rewards players for playing honest Magic and winning in the red zone. Tinker is still a thing, certainly, but when everyone else is upgrading from Tarmogoyf to Young Pyromancer to Monastery Mentor, and the Tinker target is still just Blightsteel Colossus, it seems like a lot of work for less and less a payoff. It’s no accident that the successful Oath deck of the past year often smoke screened Oath to win outside of combat with Auriok Salvagers. It only makes matters worse that people are trying to play against Mentor decks like Rich and Brian’s with cards like Illness in the Ranks, Dread of Night, Abrupt Decay, Supreme Verdict, and Sudden Shock. I could argue against each of these cards and many other worse ones, but really it comes down to lack of mana efficiency or lack of effect. Sudden Shock and Abrupt Decay are definitely really good at killing Monastery Mentor, but either we’re holding two mana up and losing because of that, or we’re letting them make some monks before we untap and losing to those tokens. Spending two mana to kill a creature just isn’t good enough in Vintage. The opportunity cost of a single mana skyrockets when it pushes us off of Time Walk, Dig Through Time, Time Walk, or even just Ponder and Preordain. Neither Sudden Shock nor Abrupt Decay are embarrassing, but they only work well in decks that are already ahead on board, like Oath or Delver. When we are behind, that extra mana isn’t worth the uncounterability because if we can’t beat countermagic, we are unlikely to catch up anyway. When it comes to ineffective, Illness in the Ranks is by far the worst offender. In just what scenario does your Illness prevent a horde of tokens but all those monk-generating spells not put you incredibly behind anyway? The more effective Illness is, the more likely you are to lose. People get so caught up with power level that they seem to forget that a 2/2 is still a card, and spending a mana and an entire card and an entire sideboard slot for something doesn’t actually do anything to said 2/2 is pretty awful Magic. A 2/2 Prowess for three mana might not be Vintage playable, but if that creature also tapped an opponent’s land and made them discard a card, it would at least be pretty close. It pays to think critically about what spells really get the job done. I believe the single best removal spell for Monastery Mentor is Dismember. 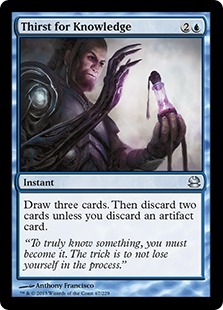 Unlike Sudden Shock and Abrupt Decay, Dismember is mana efficient and can be cast off any source. Unlike Swords to Plowshares or Lightning Bolt, it can’t be Mental Misstepped. While it can of course be Force of Willed, if our opponent Forces in defense of their Mentor and we can’t push that advantage to get ahead, we weren’t winning that game anyway. Although they get a token, they are paying a card— the one they pitched to Force— for their monk. Having our removal Forced is a pretty even exchange, but having it Misstepped puts us at a disadvantage. Dismember is the unique removal spell that has the mana efficiency of Swords or Bolt but avoids us getting blown out by Mental Misstep. Unlike Rending Volley, Sudden Shock, or any of those awful enchantments, Dismember is good against any deck that casts creatures. It’s another removal spell against Hatebears, Workshops, Merfolk, BUG, all matchups where mana efficiency is paramount. Rending Volley is interesting, and it certainly is great against Monastery Mentor and Jace, Vryn’s Prodigy. If you feel you can afford something so narrow, then you can’t do better. During coverage, Ian Duke has spoken about how Wizards’ internal playtesting had them lot higher on Monastery Mentor than Standard and Modern have been thus far. I don’t think it’s unreasonable that Wizards printed Rending Volley in Dragons of Tarkir specifically as an answer to Mentor, which they thought might be more prevalent, and to Dragonlord Ojutai, which has dominated Standard on the occasional weekend. 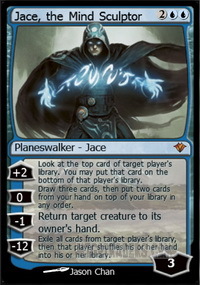 And then of course in the next set we got Jace, Vryn’s Prodigy. Each of the three creatures are Mythic Rares, and it’s easy to see the logic in Wizards printing a spell so well aimed at beating that triumvirate. As far as we are concerned, however, I’m not sure we can afford the narrowness. If you’re not in the market for spot removal, Toxic Deluge is a respectable sweeper. Radiant Flames and Anger of the Gods are fine options as well if we are not in black, but it’s rather hard to justify playing neither white nor black unless you are RUG Delver, in which case a sweeper isn’t what you want to begin with. Finally, if your deck can cast Supreme Verdict, then it can cast Monastery Mentor, and there are better ways to gain an edge in the mirror. All in all, I just think it’s unrealistic to expect to compete against a deck playing not one but two Sylvan Libraries with cards like Sudden Shock and Illness in the Ranks. No one laughs louder at such nonsense than Dragonlord Dromoka. To shortcut this whole article, I believe Vintage today and for the foreseeable future consists in great part of decks that just have mana, countermagic, draw spells, and four to eight of the best creatures available. We splash as little removal as we can get away with and figure out how much mana we need. That’s what half the format will look like. The other half will be the more vintage Vintage decks, with their combos and tutors or their rampant abuse of the graveyard or artifact specific mana. Looking at other formats for a moment, we observe that Modern does not have enough good cards to move past its heavy saturation of combo. Legacy, by contrast, has all the powerful control elements of Vintage but none of the dangerous restricted cards. Consequently, Legacy consists, with a few exceptions, of an assortment pretty stifling control decks. Neither Modern, with dozens of similarly powered combo decks passing each other like ships in the night, nor Legacy, with all its variations of control chewing each other apart, have the true diversity that Vintage has. Besides the closely curated Standard, Vintage is likely the healthiest format in Magic. I don’t think this is an accident. Vintage exists under the pressure of twenty years and 15,000 cards. For a long time, the mistakes of the game’s early years overwhelmed later printings. There was a long period when you couldn’t do better than Tinker, Tolarian Academy, Yawgmoth’s Will, Mana Drain, and Brainstorm. But Wizards is printing creatures so good these days that the power level of those old mistakes has been brought into balance. Mental Misstep and Flusterstorm certainly help as well. Delver of Secrets would probably have been banned had it existed in 1996 or 1997. Every so often, degeneracy gets a relevant card. An Expedition Map here, a Mox Opal there, but the mass of this conservative, creature-centric era of Magic exerts a lot of force on the format. Vintage invariably features the best cards ever printed, and we have reached a point where these best cards balance out pretty evenly between degeneracy and fairness. And I think we can look directly at Jace, the Mind Sculptor, and if not him then planeswalkers more broadly as being the party responsible for all these good creatures. Tarmogoyf set a new standard for what a creature could look like, but planeswalkers set the standard for what creatures needed to look like should the game maintain any sort of harmony. While it might seem silly to compare Delver of Secrets and Yawgmoth’s Will, it is incontrovertibly the case that Yawgmoth’s Will was a better card before Delver of Secrets was printed. Notwithstanding metagame considerations, the restricted cards as a whole have been getting progressively worse. Except, crucially, moxen. The moxen just get better if they have better things to cast. Nowadays, they can cast Monastery Mentor and Jace, Vryn’s Prodigy, and Snapcaster Mage and Notion Thief and Dragonlord Dromoka. Moxen break a designer’s fundamental tool of balancing the power level of a card: its mana cost. When Wizards designs Dragonlord Dromoka, they can’t afford to consider what happens when Brian Kelly casts it turn two off a Black Lotus and a Mox Pearl. When they decide how to price Monastery Mentor, they don’t worry about Rich Shay casting it turn one, following up with Gitaxian Probe, Brainstorm, and Mental Misstep, then casting Gush and three more cantrips the following turn and swinging for twenty damage against his Storm opponent. Vintage might be fairer, but it’s still lightning fast, and I just can’t always spare the time required to cast Sudden Shock, split second be damned. For the mirror, I would add some combination of Monastery Mentor, Dismember, and Jace, Vryn's Prodigy. 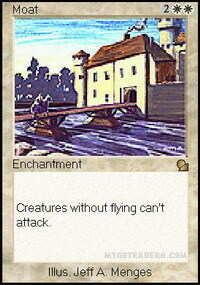 The whole point of having Moats in your deck is that you don't need to run Wraths. Mentor, Jace and Dismember just have a lot more utility than Supreme Verdict. Three mana is the rate for an unconditional sweeper in this format, and even at three mana, Toxic Deluge, Anger of the Gods, and Radiant Flames aren't all that exciting. Brian didn't run any Verdicts at EE3, for what it's worth. He had a second lifelinker, Seeker of the Way, to take the sting out aggressive decks. Dept. of Corrections: Brian actually split first with teammate Matt Murray, not finish second as written in the article above.